If you’re looking for my Wednesday Wandering, just page back for a look at popcorn fiction. Then come and join Alan and me and as we continue our discussion of alternate history fiction — and of overalls. alternate history fiction. One is the Tim Powers model, where history itself is not changed, but the reader gets an entirely new – often supernatural or science fictional – explanation for why and how things turned out the way they did. The other is the type where a limited number of historical events are changed, then the author carries the situation forward. This might be called the Harry Turtledove model, since he’s done so much of it. Typical examples are the South winning the American Civil War or the Nazis winning WWII. ALAN: Indeed so. It’s always seemed to me as a reader that the Turtledove model would be much harder to research and write than the Powers model because Powers is free to disregard the nitty gritty detail of the period. If he comes across contradictions (or makes mistakes!) he can blame it on elements of his supernatural background. For example the clown/magician Horrabin in “The Anubis Gates” allows Powers to play very fast and loose with the politics and sociology of nineteenth century London. Whereas the Turtledove model depends for its effect on legitimate historical and social constructs that simply have to be right or the story won’t work. If the Nazis win WWII and invade England you can’t disregard the role that Oswald Mosely and the Duke of Windsor would have played. And from the point of view of the man in the street, you would have to discuss the reaction to German lager appearing in English pubs. At that time you rarely saw lager for sale in England. The British predominantly drank bitter, a beer of quite a different character. Ha! I knew we’d get back to beer sooner or later. I don’t think you agree with me though. Why is that? JANE: Well, I can’t really speak to the “Turtledove model” because I’ve never done an extended piece of that sort. However, I can think of an easy way around the difficulties you suggest. Since the author is changing a few big elements, why not remove Oswald Mosely or the Duke of Windsor, too? On the other hand, why would you want to do so? After all, wouldn’t the entire fun of writing such a piece be tracing down the details that would be changed and playing with them? ALAN: I suspect there are some things that are just too fundamental to change and still take the reader along with you. Both Mosely and the Duke were strong Nazi sympathisers and would have had a prominent role to play in a post-war Nazi government. The only way you could ignore them would be to kill them off. Keeping them alive but not allowing them to influence events would probably not be acceptable to the reader who knew anything about the real historical record. JANE: I agree wholeheartedly. As I said, what would be the fun of writing an alternate history that didn’t embrace such complications? It would be like drinking instant coffee – something of the character would be lost. By the way, I love your inclusion of lager as an alternate history element. That’s the sort of subtle detail that would really make an alternate history piece of that sort “sing.” Maybe other classic British dishes would change. Bangers and mash might be made with a different sort of sausage, horrifying the purists, for example. ALAN: Wagner instead of Elgar at the last night of the proms! Oh my goodness, the horror! JANE: By the way, have you read Turtledove’s “Ruled Britannia”? I felt that in that novel Turtledove did a brilliant job of taking on a bunch of the changes that would occur if the Spanish Armada had actually won – and having Shakespeare recruited to write propaganda plays for the opposing side and then, very author-like, falling in love with both projects to the point that he sometimes forgets just how much is on the line… For me, this was a book that showed how much alternate history can do. ALAN: Yes indeed. That’s one of his very best. It’s well thought out and well written. And it isn’t part of a ten book trilogy. That’s a huge point in its favour from my perspective. JANE: Darting back for a moment, I can say that the Powers model is far from easy. For one thing, to make it work, you need to be absolutely accurate as to the historical model for which you’re providing an alternate explanation. Otherwise, the story doesn’t work. Let me use my recent novella “Like the Rain,” from the anthology “Golden Reflections,” as an example. One of the most remarkable events in American colonial history is the Pueblo Revolt of 1680, when a relatively small group of unrelated (and often antagonistic) Indians managed to throw the much better armed and armored Spanish military completely out of the area. This wasn’t a short-term victory, but one that lasted for over a decade. I decided to provide an alternate explanation for this, but this first meant making myself absolutely familiar with the material. I talked a bit about my research in one of my Wednesday Wanderings (WW 1-12-11), so I won’t repeat here, but the trick was finding real events for which I could provide another explanation. When I learned that the Spanish depositions included such things as Popay – the leader of the Revolt – apparently having supernatural advisors and performing miracles like shooting fire from his hands and feet, I was well on my way. When I learned that Popay had killed his own son-in-law, I had the heart of the personal conflict. ALAN: I agree that the initial situation and premise has to be correct in terms of the real (whatever that means!) world. But after that it seems to me that you are free to diverge quite a lot. JANE: Not really. All divergence must go on behind the scenes, so details of the actual event must be perfect. But, I do follow what you’re saying. ALAN: Speaking again as a reader, rather than as a writer, I find that the Turtledove model needs to stick so close to reality that the smallest thing can break the willing suspension of disbelief. For example, in Connie Willis’ novel(s) “Blackout / All Clear” which are set in England during WWII, she has children playing “parcheesi”, a word I’d never heard in my life before. And that immediately took me out of the book and back into my lounge. I did a bit of digging and found that the game she was referring to is the game I knew as “Ludo”. She is perfectly correct in having the children in her novel play the game (it was very popular at that time) but the use of the wrong name jarred so much that for me the spell of the book was momentarily broken. However I’d have accepted it in a Powers-mode novel simply because of the general strangeness that world view invokes. JANE: Interestingly enough, right after you brought up the Willis books, a friend who is an absolute stickler for historical details mentioned she’d just read “Blackout.” Now Sally once got taken out of a historical novel because one character was wearing overalls before they were invented. So I figured she was the perfect person to ask about the ludo/Parcheesi problem. She chuckled and admitted she hadn’t been aware of Willis’s error, so it hadn’t bothered her. Then she raised the possibility that Willis had not known either – and if you don’t know there is a question, you can’t ask it. JANE: No, Alan… Overalls are stepped into. You can’t pull them on over your head… Sorry. After all our discussions of clothing, I couldn’t resist. ALAN: But remember that from your point of view I am upside down at the bottom of the world… You’d be amazed at the difference it makes. 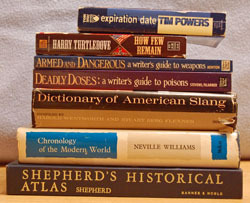 After all that research, don’t you get the urge to write a straight historical novel? Both Turtledove and L. Sprague de Camp (another brilliant alternate history novelist) have done just that. JANE: Ah… That’s a complicated question. Let’s go for it next time! This entry was posted on September 29, 2011 at 1:00 am and is filed under Thursday Tangents. You can follow any responses to this entry through the RSS 2.0 feed. You can leave a response, or trackback from your own site. It seems, in a way, that you’re talking about the difference between finding the known spots on the map (alternate history) and finding the blank spots on the map (magical history), and working in each. Doesn’t it depend on the period? For example, I’ve heard of Popay’s revolt, but I’ve read perhaps three or four pages on it, total. You could fit a dragon in for fire support in a magical history of the revolt, and it wouldn’t necessarily pitch me out of the story. I just don’t know enough to be repulsed. And I like dragons. Speaking of blank spots, Jane, have you read Mann’s “1491” or “1493” yet? “1493” just came out, and it made me realize how little American history I really knew. I mean, at least I’d heard of maroons and quilombos, but I never considered that Indians and escaped blacks have a history stretching back 500 years, and neither of them were quite the passive victims of history that they’re portrayed to be. When Brazil recently legitimated maroon land claims, all of a sudden, hundreds started coming forward, to claim the land their people had farmed for centuries. Talk about a hidden history. I really like the “known spots on the map” vs the “blank spots on the map” as a way of looking at the types of alternate history. I’ll use that if I’m ever on a panel on the subject. I haven’t read the books mentioned, but they sound interesting. I agree with Paul that the sort of time travel history he mentions where nothing changes would be a disappointment. This kind of time-travel – nothing changes – could be done effectively if the author can work out, and show convincingly, how things might have been _worse_ without, say, that sub lurking in the background. A riff on the usual ‘time traveller causes the historical event’ version of tt. BTW, if you’d like to try your hand at alt-hist, maybe you could join Dave Weber in Eric Flint’s sandbox. That might be interesting, but from what I’ve heard, Mr. Flint’s sandbox is pretty crowded! Interesting take on “nothing changes. ” You’d need a good POV character so that the story didn’t turn into a lecture, but done right it could be fun. Actually I’m having a lot of fun with “nothing happens” time travel. The idea is how much trouble the time patrol has to go to, just to keep history happened. Poul Anderson wrote his whole time patrol series around this idea. I’m having more fun with deep time. The idea I’m running with is that time travel is actually quite easy, and there are people living all through Earth’s geologic history right back to the beginning. They leave no traces because a) it’s easier that way, no messy paradoxes to piss of your down-time trading partners, and b) they don’t want riff-raff like us to find out and mess up their party. It’s a fun venue for social commentary, if nothing else, and the efforts the history service goes to in covering things up is the hook for each story. I enjoyed the Time Patrol stories quite a bit.